The field of racing comedies isn't very big, but Talladega Nights: The Ballad of Ricky Bobby ranks among the best. 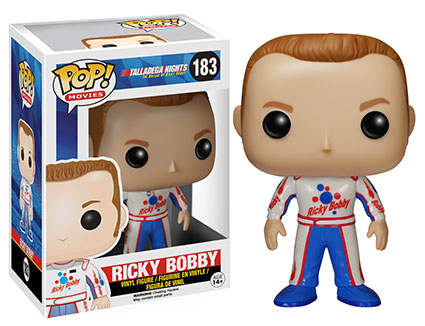 The Funko Pop Talladega Nights vinyl figures put a collectible spin on the Will Ferrell comedy. Leading the pack is the man, the myth, the legend—Ricky Bobby. He's joined by his shakin' and bakin' best friend, Cal Naughton Jr., and race track nemesis Jean Girard. All three are decked out in their racing jumpsuits, albeit somewhat altered to drop the sponsor logos. The Funko Pop Talladega Nights figures expand the Pop! Movies line. Outside of a Ricky Bobby bobblehead that came packaged with the DVD as a Best Buy exclusive, these are the first figures of any kind for the movie. 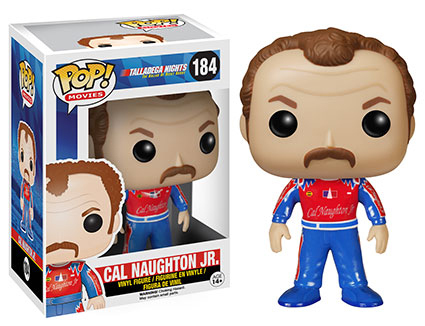 In fact, other than some commemorative cars and posters, Talladega Nights hasn't had much in the way of licensed merchandise. Released in 2006, Talladega Nights stars Ferrell, John C. Reilly, Sacha Baron Cohen, Leslie Bibb, Amy Adams and Michael Clarke Duncan. It not only ranks as one of Ferrell's highest grossing films, but one of the top sports comedies of all-time.